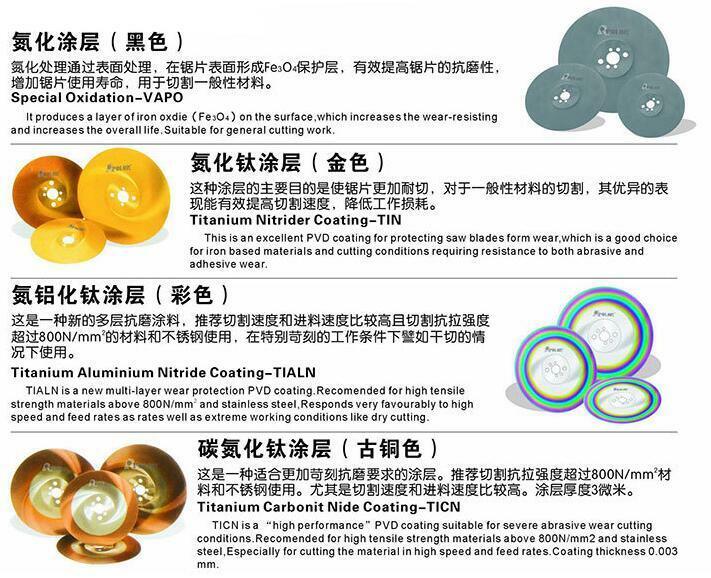 Saw blade includingÂ Â metal hot-cutting circular hss circular saw blade, metal cold-cutting circular hss circular saw blade , TCT circular hss circular saw blade , HSS segmental circular hss circular saw blade , and diamond circular saw blank . 1.5" 40 5/8"Â toÂ 2"
8" 200 5/8"Â toÂ 2"
10" 250 5/8"Â toÂ 2"
12" 300 5/8"Â toÂ 2"
14" 350 5/8"Â toÂ 2"
15" 400 5/8"Â toÂ 2"
19" 500 5/8"Â toÂ 2"
The different kinds of tooth forms are used according to different requirements of cutting. Â How to choose the right tooth form? 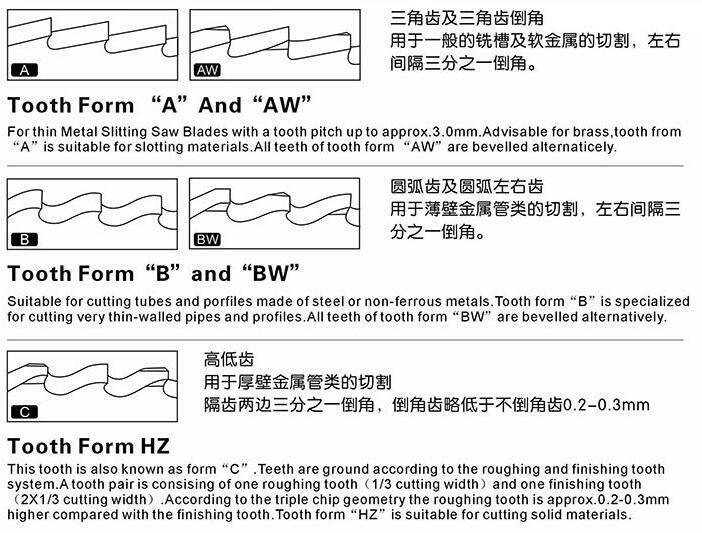 Â 1.Tooth form "A" and "AW"
suitable for slotting materials. All teeth of tooth form "AW" are bevelled alternatively. Â 2.Tooth form "B" and "BW"
Suitable for cutting tubes and profiles made of steel or non-ferrous metals. Tooth form "B" is specialized for cutting very thin walled popes and profiles. All teeth of tooth form "BW" are bevelled alternatively. This tooth is also known as form "HZ". Teeth are ground according to the roughing and finishing tooth system. A tooth pair is consisting of one roughing tooth(1/3 cutting width) and one finishing tooth(2x1/3 cutting width). According to the triple chip geometry the roughing tooth is approx.0.2-0.3mm higher compared with the finishing tooth. 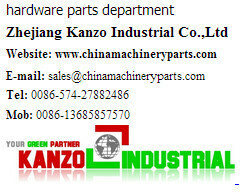 Tooth form "HZ" is suitable for cutting solid materials. Tooth form BR is a parrot tooth with chip breaker.This tooth form is sutiable for cutting pipes under high performance conditions because the teeth are side cutting.